Private Self Contained Cottages on a Beautiful 35 Acre Rural Property. Anderley has 2 cottages available. Taronga offers: Modern open plan design, a Queen size bed. Breathtaking Views: Double Spa: Cosy Wood Fire: Quiet Rural Setting: Reverse cycle cooling/heating: Full kitchen & BBQ: All Linen and Towels supplied. You can see Tandara listed under Yarragon or Gippsland - (the cottages are the same physical size overall and the same cost for a couple). Anderley is only 90 mins from Melbourne CBD and less than 10 mins from Yarragon Village. 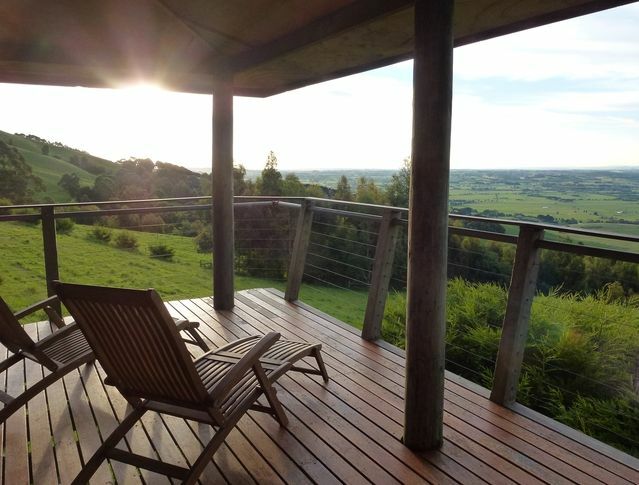 Ideally situated in the foothills of the Strzelecki Ranges, Anderley is just a short drive to many of West Gippsland's attractions. You can easily spend several days exploring the area. or just sit back, take in the view and relax! Relaxing Massage and Pain Relief Therapy Treatments are available. *Yarragon Village is a delightful place to spend time browsing in the antique and specialist shops, or trying out one of the many little cafes. *A bush walk through the Mount Worth State Park (about 15 mins drive from Anderley). *A drive to Mirboo North (about 35 mins each way from Anderley). Famous for its brewery, you can sample and purchase many boutique beers. A scenic drive to a pretty town. *Mt Baw Baw is about 90 minutes away drive up the new South Face Road and spend some time - summer or winter - in this stunning area. Dogs are welcome, subject to our dog policy as outlined below. Please note there is an additional charge per stay of $25 for a maximum of 2 dogs. •	Guest's dogs may have inside access to the cottage. Please note that there is not a secure dog run available, but the deck of the cottage is secure. •	Dogs must be on a leash at all times whilst outside on the property unless you can trust their recall. Please discuss with us on arrival. •	If your dog’s recall is trustworthy, you may access a large area of cleared land adjacent to the cottage for off leash runs - away from the farm animals. •	Dogs must be kept off beds and soft furnishings -dog hair on furnishings will incur an additional cleaning fee. •	Dogs must not be left unattended in the cottage and must accompany guests when they leave the premises for outings. •	On the property there are farm animals, native wildlife and birds and a resident dog and cat. We ask you to consider both their safety and your dog's safety if your dog is around them. Please keep your dog on leash in these areas. •	Barking must be controlled at all times. •	Washing of Dogs in the bath/sink is strictly prohibited. If your dog is muddy/dirty, we can provide an extra bucket to aid washing if required. •	If excess cleaning is required or if it is necessary to repair any damage caused by your pet, this cost will be your responsibility. Cosy wood fire (we supply the wood) for lovely winter fires (reverse cycle heating also provided). We are in an internet "black spot" and seeking solutions. There is excellent 4G Telstra and Optus coverage from the cottages. If needed, guests can access our wireless service from the house. We had a lovely stay here. The cabin is so perfectly decorated to make you feel at ease. Our fur baby loved the outdoors especially the cows. Such an easy break from the city. Highly recommend! Thankyou for a wonderful stay. We had a great, relaxing short getaway. A well thought out and comfortable cottage, the perfect place to unwind. Thank you Lee & Andrew for sharing this hidden gem with us, we will be sure to come back soon. Great choice, highly recommended, we hope to return for another relaxing weekend. Very high standard accommodation. Thanks Cathy, glad we were able to host your family get-together. Your two little dogs looked like they enjoyed the rural environment - despite the cold weather! A warm and inviting cottage with a tremendous view. We had the most beautiful long-weekend stay here. The property is stunning, immaculately clean, incredibly comfortable and simply just warm and inviting. Our hosts made our check-in/arrival and check-out so easy and they were absolutely lovely - even going to the trouble of posting back to us a jacket we left behind! We brought our little dog with us and it was such a joy to watch him happily run around the decking and spend the time with us. We will be back. Many times I would think!